A bio-pic that forces you out of your comfort zone. 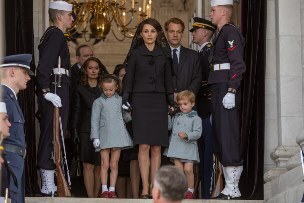 And to give you a few hints that this really isn’t what you’re expecting: John F. Kennedy is not a character in the movie – you barely get a glimpse of him even before his death; same goes for her children, and her assistants and the new White House residents. It’s just Jackie. 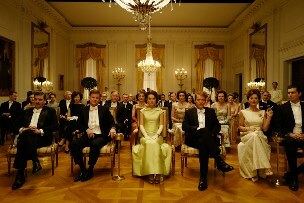 The movie opens with Jackie (Natalie Portman) giving an interview about her life after the death of her husband. But here’s the kicker: this isn’t a tell-all, she won’t give the interviewer anything new, personal, private, or interesting. And here’s the kicker for the filmmakers: they have to create a movie about the personal, private and interesting life of Jackie Kennedy framed around this interview where none of the above is accomplished. The fact that director Pablo Larrain succeeds is odd indeed. For the most part Jackie takes well-known scenes, and just shows it from a different angle. A famous TV tour of the White House that she gives, but not from the point of view of the cameras, but temporarily show her assistant watching it from behind the cameras. Or newly-widowed Jackie with blood smeared across her face, this time with just a glimpse of how Lady Bird Johnson experiences that moment. The film puts us in strangers’ hands while also just focusing on Jackie. There’s a very deliberate pace (that ends up delivering a very short run-time), with captivating framing, all with Jackie in her designer clothes, and a unique score (often playing over Jackie sitting still with no dialogue). Part of the problem is that there’s very little emotional connection to Jackie. Despite being the central focus, the audience is kept at a distance (after-all, Jackie has no intention of letting the public really know who she is) with very little empathy afforded for her. That’s not the usual formula for a bio-pic. But that’s also precisely why Jackie is so good. Everything in the movie is approached in such a unique way that you never really know where you’re going next or what you’re going to learn that you become very invested. And in the end, you do know Jackie a little bit more than you did before.